As I've occasionally said on here I've been jogging for the past two years, an effort to get fitter and keep the weight down. One challenge I have is avoiding boredom when doing a weekly long run. I've written before about routes around Glasgow I've made up to keep me motivated, eg running around all the Glasgow football venues. As the only race I've got coming up is the 5km Santa Dash on 11th December and I'm running shorter distances over the winter, I decided to think up a new training route, with points of interest along the way to keep me motivated. So with Partick Thistle still on track for promotion at the end of the season I have come up with a wee route steeped in the history of Glasgow's second oldest senior football club (Queen's Park were founded in 1867). To come up with my route I looked at Niall Kennedy's "Partick Thistle - The Early Years" website and the book "Partick Thistle Football Club 1876 - 2002 The Official History" by Robert Reid and others. Its a great book, particularly as my face is in the crowd photo on the cover. Before heading out I looked out a suitably old Thistle top to go running in, but couldn't bring myself to wear Stephane Bonnes's signed one that I've got. Although it is sort of the 1905 colours, I settled for an old red and yellow hooped one - which we should get back to ASAP (although it only started in the 30's it just seems better than what we are wearing at present). More astute observers may have noticed that Partick Thistle don't live in Partick now. Firhill Stadium in Maryhill has been the home of Partick Thistle since 1909. Dumbarton Harp were the first team to score here on 18th September of that year, although Thistle came back to win that match 3-1. So where in Partick did they start? 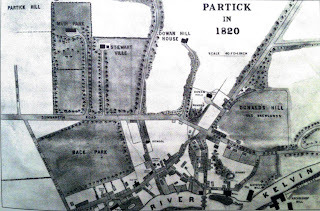 Partick was still a small village outside of Glasgow city in the early 19th century known for its mills. Less than 2000 people lived here in 1832. Industrialisation meant that the population quickly rose, particularly with the arrival of shipbuilding along the north bank of the Clyde from Scotstoun, through Whiteinch and Partick. By 1872 the population of Partick had reached 17,000 bringing more buildings (Partick Burgh Halls were built in 1872) and several football teams. There is some disagreement about where Partick Thistle played their earliest games. Some people suggest it was in a public park now built over with Kelvingrove Art Gallery. However Niall Kennedy gives a good argument for placing the earliest recorded games for Partick Thistle from 1876 about 100 yards further southeast in Overnewton Park. This ground was also used then by Partick Violet, Partick Ramblers football teams and for cricket. So this seemed as good a place as any to start my run. The most likely spot for this old ground is at Overnewton Square, just south of Dumbarton Road, diagonally opposite the Islay Inn. There is now a wee swingpark here amidst a modern housing development. I watched Rangers beat Leeds in Europe in a friend's flat in Overnewton Square a few years ago, unaware of the historic setting. Overnewton Square. Home of Partick Thistle from 1872-1880? In 1880 the population of Partick was now 27,000. People like my great-great-great grandmother had come from Ross and Cromarty and were living here now. Partick Thistle joined the SFA and moved into their own private ground 2 miles further west. This was at Jordanvale Park in Whiteinch, at the junction of what is now Edzell Street and Dumbarton Road, where St Paul's church now stands. The next wee bit of this run was basically loops along Dumbarton Road and South Street between Partick Cross and Whiteinch. This Jordanvale Park site I quite liked re-visiting as I used to stay on Dumbarton Road about 50 yards from here, in a tenement that no longer stands, until I was 5 years old. After 3 years of problems with this ground Thistle moved to Muir Park, at the bottom of what is now Gardner Street. However in 1883 there was no housing here and the land was being used as a strawberry field apparently, beneath a private zoo housed on the slope above. The pitch created was adjacent to Partick Bowling Club and the West of Scotland Cricket Ground, next to Partick Burgh Halls. Now there's not much to see here, just the typical tenement buildings that were being built 3 months after Thistle moved out in 1885. They played their last game against Partick FC at this ground and when that team was wound up that year, Partick Thistle moved to their ground at Inchview. I'm sure there must have been conspiracy theorists of the day raising an eyebrow at that one. So as I've decided to run around these grounds in chronological order, like some confused Victorian season ticket holder trying to follow his team, it is 1 mile back along Dumbarton Road to Whiteinch again. This time I end up 50 yards east of my old home as the site of Inchview now lies under the buildings of the north entrance to the Clyde Tunnel. So, as a child I played just about on this spot, out in our back court for 5 years, Partick Thistle played here for 12 years. Whereas I moved to Maryhill in 1976, Thistle's next move was back to Partick, or Meadowside to be precise. In 1908 the club had to move on, as the land was to become Henderson's shipyard. This piece of land between the new transport museum and the Glasgow Harbour flats is at present empty, awaiting development. The last remaining building that stands of the Henderson Shipyard marks the site I imagine the ground occupied. Leaving here to head up Byres Road I passed over the new walkway which marks historic events of the Meadowside area, including the arrival of Partick Thistle. For Thistle a nomadic year was passed, with home games at Ibrox, Shawfield, Parkhead and Hampden. After 32 years in Partick and Whiteinch a move to Maryhill was considered. A piece of land was found in Maryhill, beside the canal on Firhill Road. A playing surface was levelled and a stand for 1,600 people built. Partick Thistle were now a Maryhill club, so that's where I'm off to next. Running it in this order was a daft idea in retrospect, as it meant finishing this 13km route by climbing up the hill that is Fergus Drive to get to Maryhill Road, then down the appropriately named Stair Street (basically two flights of stairs). Anyway this is now familiar territory for anyone who makes their way regularly to Firhill and I finally reached our current home, where we've been for 93 years. Anyway, if you've followed me until now, make your own way home. I apologise for any glaring errors and hope that at least if you don't fancy taking a run around this daft route (which turned out to be a bit longer than I imagined) then can I suggest at least you take a wee walk along these parts. I ran home along the canal but took ages as I was hypnotised watching a cormorant coming up with fish after fish after fish. You never saw that when I lived opposite the canal in the early 80's! If you care to take a wee walk down memory lane along this route, here it is on MapMyRun. Great stuff here, I've always wanted to do a wee tour of these sites (in car of course!!) found an old map that pinpointed Meadowside under the first set of new Glasgow Harbour flats, I always thought it was closer to Kelvin.